Hiking the loop around Spooner Lake is entertaining and educational. The views are mostly restricted to Spooner Lake and the neighboring forest, but the lake is host to an abundance of wildlife and wildflowers. Additionally, there are multiple infographics along the trail that feature information and imagery about the history of the Spooner Lake area and the wildlife that inhabits it. Since there’s relatively no elevation gain and the distance around the lake is barely over two miles (with many sitting benches), hiking around Spooner Lake is ideal for the young and old. If you’re a Tahoe local, Spooner Lake is a great location to get in a quick hike before or after work. And when there’s enough snow during the winter, the Spooner Lake area is a stellar location for cross-country skiing and snowshoeing. Click on the above map to enlarge it for better viewing and printing. This map is only for reference and shows the general hiking area around Spooner Lake. Always carry a traditional topographic map and compass when traveling in the backcountry. Parking is available either at the main entrance on the west side of Spooner Lake or at Spooner Summit (east of lake). The first thing to know about the Spooner Lake area is that it’s part of the Lake Tahoe Nevada State Park system and requires an entrance fee no matter the means by which you arrive or the season in which you recreate. Fees are required year-round (and may vary), but during the summer of 2018 they cost $10 per vehicle when entering via the main entrance or $2 per person when accessing the Spooner Lake area by hiking, cross-country skiing, snowshoeing, biking, riding a horse, or getting dropped off by bus. 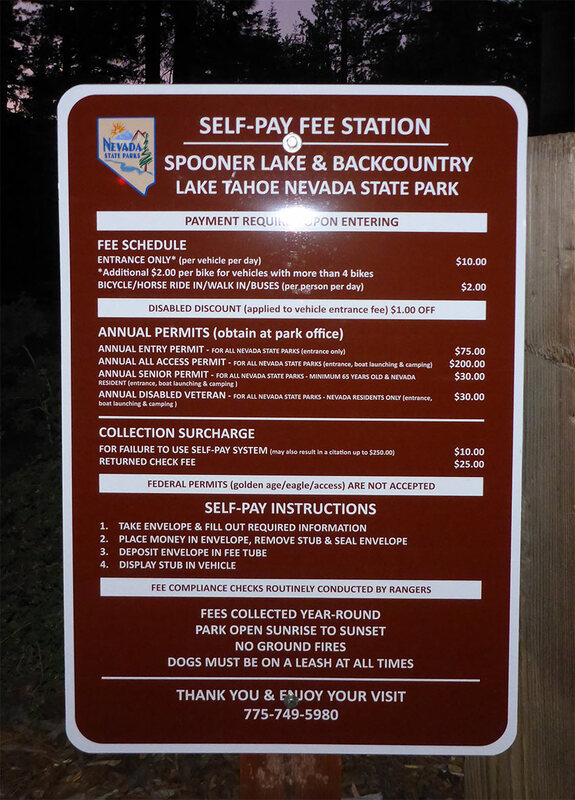 For example, even if you park at Spooner Summit (see below) you’ll still need to pay $2 per person to enter the Spooner Lake area. There are two main parking options for accessing Spooner Lake. The first and most convenient option is to park at the main entrance off of SR 28, just north of the intersection of HWY 50 and SR 28. In addition to parking spots, you can also find public toilets, picnic tables, and barbeques located at the main entrance. The trailhead when parking at the main entrance is basically at the public toilets. The second parking option is at the north lot on Spooner Summit, which is slightly further east of Spooner Lake on HWY 50. Parking at Spooner Summit is free, but you’ll have to hike approximately 1 extra mile (roundtrip) to access Spooner Lake from this location and still pay $2 per person to hike into the Spooner Lake area. 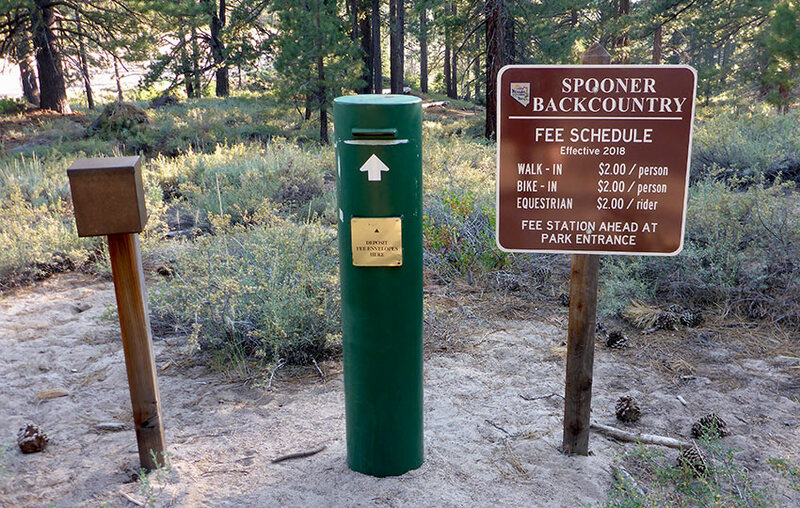 For this “back door” to Spooner Lake, there are envelopes and an iron ranger (to deposit your envelope and cash) about 100 meters north on the Tahoe Rim Trail. This walk-in pay station is the trailhead to access the Spooner Lake area from its eastern border. Here’s a map to help you find the main entrance to the Spooner Lake area. For parking at Spooner Summit, continue driving along HWY 50 until you reach the north parking lot for the Tahoe Rim Trail. From the public toilets at the main entrance, hike down the hill along a short trail that lasts a few hundred meters to arrive at Spooner Lake. At this point, you should be standing in a relatively open area and looking at the lake. You should also see some trails and dirt roads that appear to go around the lake, as well as various signs indicating the Spooner Lake Trail, mountain biking rules, and some fishing information. For hiking during the summer around the lake, choose the trail (either clockwise or counter clockwise) that’s located closest to the lake. From the parking lot on Spooner Summit, hike north on the Tahoe Rim Trail approximately 100 meters to find the self-pay station and “back door” to the Spooner Lake area. The trail leading down to Spooner Lake is just shy of a half mile and will intersect with the Spooner Lake loop trail. This little spur trail is also where you’ll have to negotiate the most elevation gain at any one time (approximately 150 feet), which is negligible all things considered. Once you reach the Spooner Lake loop, pick a direction in which to hike around the lake (clockwise or counterclockwise) and enjoy your journey. I know of no compelling argument for traveling in one direction versus the other (clockwise or counterclockwise) around Spooner Lake. The only thing I would consider is where you’ll be standing once the sun rises or sets (so long as you’re in the park at either of those times). Viewing the sunrise will be best from the north and west side of the lake, whereas watching the sunset from the south and east side will afford the best views. Just keep in mind that this is a day-use park, however, so once the sun sets head back to your vehicle immediately and leave the park. Please note that Spooner Lake is not a swimming lake. Enjoy the views, but only from the shoreline. When traveling around Spooner Lake during the winter, I recommend giving it a wide berth. Although the lake is not very deep, it’s located on the east side of Lake Tahoe which means it doesn’t receive nearly as much snow as the west shore. And because the Spooner Lake area is wide open, it receives lots of sunlight throughout the day. So, I wouldn’t expect the lake to be frozen enough for safe travel. For many years there was a thriving cross-country ski operation at Spooner Lake, but the drought years of 2011-2015 (and a desire to retire) convinced the owners of that operation to close up shop. Then, in 2017, the volunteer organization Nevada Nordic took up the cause. 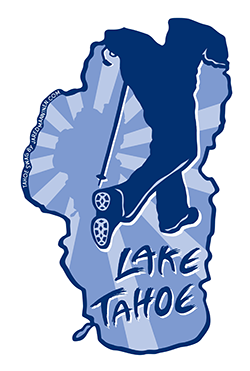 So, check out the Nevada Nordic website for updates regarding grooming operations around the Spooner Lake area. ← Share Your Story: Is the Creation or Capture of a Perfect Image a Worthwhile Pursuit?